We have the official basketball court dimensions and measurements for each of the different levels of play. If you are wondering how big a standard basketball court is or how to build a basketball court, we have the answers! Regulation sized basketball courts vary in sized depending on whether you are looking at High School, College, International or the NBA. However, among all these different levels there are a number of specifications and regulations that are the same, such as the free throw line and height of the basket. 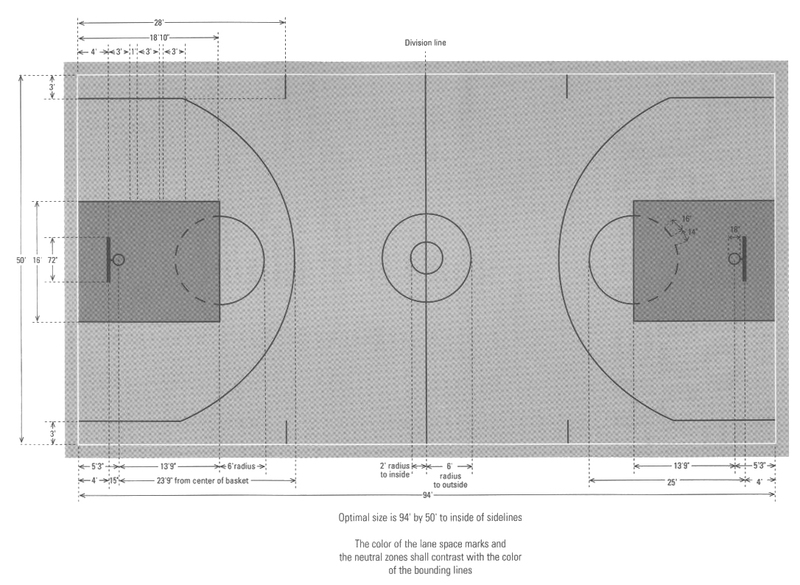 The printable drawings below show the dimensions to help you design that perfect indoor or outdoor basketball court! High school and NCAA basketball courts tend to be the same dimensions. The 3-point line, free throw line and other general dimensions are the same. If you are building your own backyard or indoor basketball court we recommend that you use the measurements shown above. These are the most standard dimensions used on courts within the United States. Also, if you are placing a hoop into the ground using concrete, please make sure to use 900+ lbs of concrete to hold the pool and hoop in place unless you want issues down the road. The rim will be 10 feet above ground. Outside of that - you should be able to get everything you need from the diagrams shown above. The NBA court is generally slightly bigger in many respects compared to the college court. Players lining up along the key of the basket during a foul shot will find themselves further from the hoop. Three-point shooters shoot from 23 feet and 9 inches above the key, although the shot is shorter from the base line. The court length is 94 feet rather than 84 feet for high school. The International Basketball court's most notable difference is the key that angles away from the basket. It is almost a compromise between the college level and NBA level. Another notable feature is the 3-point line which is just slightly beyond the circle above the key making the shot just slightly more challenging.